Phil Hellmuth started day 3 of the Bay 101 Shooting Star tournament as the chip-leader, and was not only able to survive, but to thrive. Hellmuth will enter the televised final table with 1.4 million chips, which is good enough for second place behind chip-leader Andy Seth’s 2.1 million chips. Also seated at the final table will be WSOP bracelet winner Hasan Habib, making his third World Poker Tour final table. Habib will begin the day with 455,000 chips. Look for Habib to come out aggressively, in an effort to get his chips in the middle and double-through, when the final table resumes later today. Hellmuth is the sole remaining player with a bounty on his head, worth $5,000. Play will resume at the final table at 4pm PST, when the players will reconvene to battle it out for the $878,500 first prize. UB Poker, or until recently Ultimate Bet, has been about for a few years now. It has been growing every year steadily, but not dramatically to keep up with Full Tilt or PokerStars. UB Poker also have two of the biggest names of poker as their figure heads, Phil Hellmuth and Anne Duke. 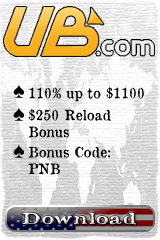 You can also get an amazing deposit bonus at UB Poker just by using a UB Bonus code: PNB. This UB Bonus Code will get you 110% bonus up to $1100 plus reload bonuses. Making this one of the best poker bonuses available at the minute. This entry was posted on Friday, March 12th, 2010 at 10:05 am and is filed under Poker News. You can follow any responses to this entry through the RSS 2.0 feed. You can leave a response, or trackback from your own site.